Hellenic College encourages all employees to utilize the direct deposit benefit. With direct deposit, money is automatically deposited into your checking or savings account on the designated pay date. Direct Deposit helps avoid lost checks and saves unnecessary trips to the bank. Use Form W-4 to figure the right amount of federal income tax to have withheld from your paycheck. You may want to review your withholdings every year, especially after finishing your tax return. You can make adjustments to have more or less income tax withheld from your paycheck. The I-9 is a U.S. Citizenship and Immigration Services form. It is used by an employer to verify an employee’s identity and to establish that the worker is eligible to accept employment in the United States. Hellenic College, Inc. is an Equal Opportunity Employer. Hellenic College Holy Cross is a member of The Tuition Exchange, a reciprocal scholarship exchange program for eligible dependent children of employees of higher education institutions. Over 600 U.S. colleges and universities participate in the Tuition Exchange program. A general overview of The Tuition Exchange program and how it coordinates with Hellenic College Holy Cross is available here. 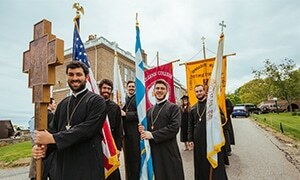 The Tuition Exchange Program at Hellenic College Holy Cross is administered by the Office of Finance and Administration and is coordinated with the Office of Enrollment Management to balance imports (students coming to HCHC) and exports (children of HCHC employees wishing to go to other Tuition Exchange schools). Currently the Hellenic College Holy Cross Tuition Exchange Program offers up to four years (eight semesters) of undergraduate education for incoming freshmen and transfer students. HCHC also offers tuition scholarships for graduate students for the term of their program. The Hellenic College Holy Cross Tuition Exchange Program Liaison Officer is Kevin Derrivan, Chief Financial Officer, 617.850.1222 or kderrivan@hchc.edu. Must qualify as a dependent of a current full time faculty or professional staff member who, prior to the first day of classes for the term for which Tuition Exchange benefits are sought, is in a full-time position and has served a minimum of one year of full-time employment at Hellenic College Holy Cross. Must not have reached his/her 25th birthday. Being selected for a Tuition Exchange Program award by Hellenic College Holy Cross. Note: Being certified for the Tuition Exchange Program scholarship award does not qualify a student for admission to a participating Tuition Exchange Program institution, nor does admission to a participating Tuition Exchange Program institution qualify a student for a Tuition Exchange Program scholarship award. In order to receive Tuition Exchange Program certification, the Hellenic College Holy Cross employed parent or guardian of the student must submit a Tuition Exchange Program Application to the Hellenic College Holy Cross Office of Finance and Administration. If the number of eligible students for the Tuition Exchange Program scholarship award is equal to or less than the certifications available, all students will be approved for Tuition Exchange Program certification. In the event that more eligible students apply for the program than can be accommodated, the length of Hellenic College Holy Cross service by the eligible employee will be the factor utilized for certification. Eligible employees with the longest full-time service will be certified first to apply for a Tuition Exchange Program scholarship award. If an eligible employee presently has one dependent receiving a Tuition Exchange Program scholarship award, additional eligible dependents will be rank ordered below the last eligible applicant until the sibling’s slot becomes available. In the case of multiple employees applying who have the same service date, ties will be broken by analysis of need, and a FAFSA (Free Application for Federal Student Aid) must be submitted by the concerned parties. Please note that there is a $500 fee, made payable to Hellenic College Holy Cross, for each accepted student to the exchange program. The accepted student will also be charged $25 per course credit. The $500 fee and course credit charge will be pooled each year and used to provide future scholarships to employee children that attend non-member colleges and/or universities and cannot benefit from this program. Funds received through the Tuition Exchange Program are to be used solely for tuition expenses. All enrollment and processing fees are the responsibility of the student. The student must submit an application for admission to the participating Tuition Exchange Program at the institution of possible attendance. Admission applications must be completed in accordance with each institution’s admission requirements and procedures. This process occurs the fall prior to the student’s anticipated fall semester of enrollment at a participating exchange institution. Visit the Tuition Exchange website for a list of the participating institutions. Each exchange institution independently determines its Tuition Exchange Program policies and procedures. The Liaison Officers at the exchange institutions will notify the student that their application has been accepted or rejected for a Tuition Exchange Program award.